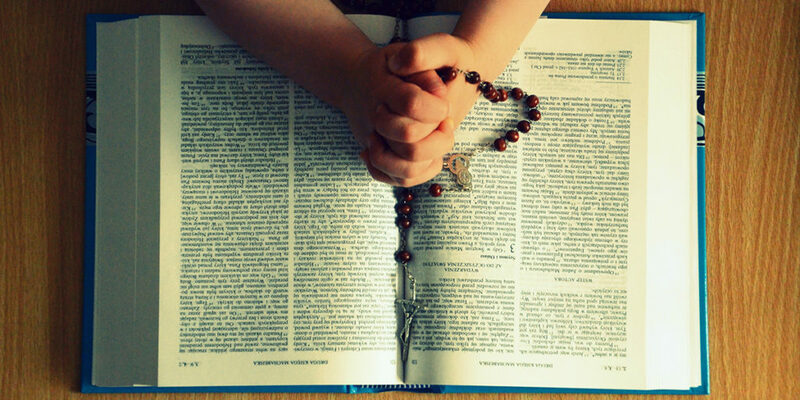 The Church has given us so many ways to pray, and one of the most beloved is the Rosary. The tactile aspect of holding a rosary and passing each bead through one’s fingers has a comforting feel to it. Just holding a rosary can put us into an attitude of prayer, but how many times do we begin a Rosary with determination only to realize that our minds have lost track of where we are within the prayer? Our minds are made to focus on one thing at a time, so most anything can pull our minds in a whole different direction than what we first set out to do. The phone will ring, a notification will ding, a child will sing, a bird will wing, the car will ping. We have good intentions to pray but life goes on around us. A quiet place and time can make a huge difference in our ability to meditate on the mysteries of the Rosary, but I have had some success with praying the Rosary as a challenge in the midst of chaos. Since much of life is noisy and disruptive, perhaps one way to approach it would be to meditate in the midst of life. Once, while at the Minnesota State Fair, one of the biggest in the country, I was with a group who stopped to rest a while near a stage where a band played some rock songs of which I didn’t recognize the lyrics. I challenged myself to spend that time praying since it was so loud that I couldn’t hear any conversations around me. I made it through five mysteries of the Rosary and felt that I had redeemed the time. I was able to hold my focus on the prayer in the midst of the noise. Bishop Paul Dudley told me the story of his dear mother how, as she raised her several children on their farm, she found time to pray in the midst of the hub bub in the tiny house. She simply took her apron and put it over her head. The children all knew not to bother her in those moments. One of my favorite memories of the Rosary was during a very long drive from Minnesota to Ohio by myself. I decided to meditate on every single mystery for as long as I could. I imagined every scene, tried to recall all the scriptural accounts or any sermon or insight I could remember about each one. I think I made it all the way across Indiana on that Rosary. I felt like I had encountered Jesus in a true sense through the eyes of his mother. The more familiar one becomes with the actual mysteries, the easier it is to focus while praying. It becomes clearer and more vivid with each Rosary. A picture aid is also a great way to keep focus. Pictures keep our attention and spark our imagination further. Put together your own favorite set of images or purchase a Rosary companion. Above all else, build a discipline into your life that triggers a Rosary. Much as when we sit down to eat, we automatically thank God for the food, so too, find a time in the day that triggers the habit to pray the Rosary. Even if we don’t get through the whole thing every time, a portion of it brings us into the presence of Jesus and invokes Our Mother’s intercession. Emily received her bachelor of arts degree in classical and Near Eastern archaeology from the University of Minnesota, and is a tour leader of annual pilgrimages to Israel and other Bible-related destinations. She is the developer of the Great Adventure Kids Bible study resources, and co-author of The Great Adventure Storybook. She co-authored the Walking Toward Eternity Bible Study Series, Part One (Daring to Walk the Walk) and Two (Engaging the Struggles of Your Heart) with her husband, Jeff. She is also the author of Lily of the Mohawks: The Story of St. Kateri, and Catholic Family Night, a series of lessons covering all three liturgical reading cycles with one lesson per week throughout the entire year. Emily lives in Minnesota with Jeff, her husband of over thirty years. So Was King David Real?